These Brownie Vests are a Girls Size Small (6-8), and are a retired version that is a littler shorter and of a thinner material. They may still be used and worn by current Brownies, they will just be shorter than the newer versions. Or they would make a nice collector's item. Official Girl Scout Brownie Try-its and other Official Insignia shown on Vest are sold separately. This Junior Girl Scout Safety Award Pin is a RETIRED Girl Scout Award. This pin has been replaced with a new version: Junior Safety Award Pin. The older style pin is no longer an official uniform piece, but is a great collector's item. All retired merchandise has been stored new in the GSEWNI Council Store, but may show signs of it's age, including light damage to books or boxes. Retired merchandise in non-refundable. This Cadette/Senior Girl Scout Safety Award Pin is a RETIRED Girl Scout Award. This pin has been replaced with new versions: Cadette Safety Award Pin and Senior Safety Award Pin. The older style pin is no longer an official uniform piece, but is a great collector's item. All retired merchandise has been stored new in the GSEWNI Council Store, but may show signs of it's age, including light damage to books or boxes. Retired merchandise in non-refundable. The Sign of the Sun is a RETIRED Girl Scout Award. The requirements for these awards are no longer a part of the official Girl Scout Program. These awards are great collector's items. When you follow your values in your life (remember, values are the things that are most important to you), you have a better sense of where you want to go and how to get there. In the Sign of the Sun, you will do activities that allow you to reflect on and practice both Girl Scout values and personal values. All retired merchandise has been stored new in the GSEWNI Council Store, but may show signs of it's age, including light damage to books or boxes. Retired merchandise in non-refundable. The Sign of the World is a RETIRED Girl Scout Award. The requirements for these awards are no longer a part of the official Girl Scout Program. These awards are great collector's items. Girl Scouts promise to improve the world around them. You build leadership skills and contribute to your society when you do a service project that helps others. The Sign of the World helps you to join forces with other Girl Scouts to make a difference in your communities. All retired merchandise has been stored new in the GSEWNI Council Store, but may show signs of it's age, including light damage to books or boxes. Retired merchandise in non-refundable. The Dreams to Reality award is a RETIRED Girl Scout Award. The requirements for these awards are no longer a part of the official Girl Scout Program. These awards are great collector's items. Dreams to Reality is an award for Cadette Girl Scouts to explore careers. This collectible book is filled with information and activities for Junior Girl Scouts. It has been retired from official use, but still includes great information. It is also a fun item for a collector of Girl Scout memorabilia! All retired merchandise has been stored new in the GSEWNI Council Store, but may show signs of it's age, including light damage to books or boxes. Retired merchandise in non-refundable. 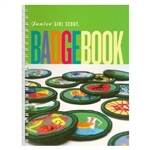 This collectible book contains information on earning the old Junior badges. It has been retired from official use, but still includes great information and fun activities. It is also a fun item for a collector of Girl Scout memorabilia! Spiral bound. All retired merchandise has been stored new in the GSEWNI Council Store, but may show signs of it's age, including light damage to books or boxes. Retired merchandise in non-refundable. This collectible book has great information for Leaders of Junior Troops. It has been retired from official use, but still includes fun activities for Junior Girl Scouts and advice for leaders. It is also a fun item for a collector of Girl Scout memorabilia!